September 24, 2012 by A. Over the weekend I indulged in my first-ever CrossFit Fundamental class. A few friends had directed me to the program, saying it was very “me” and “suited my body type,” so after sufficient procrastination, I finally got around to signing up for a trial session. 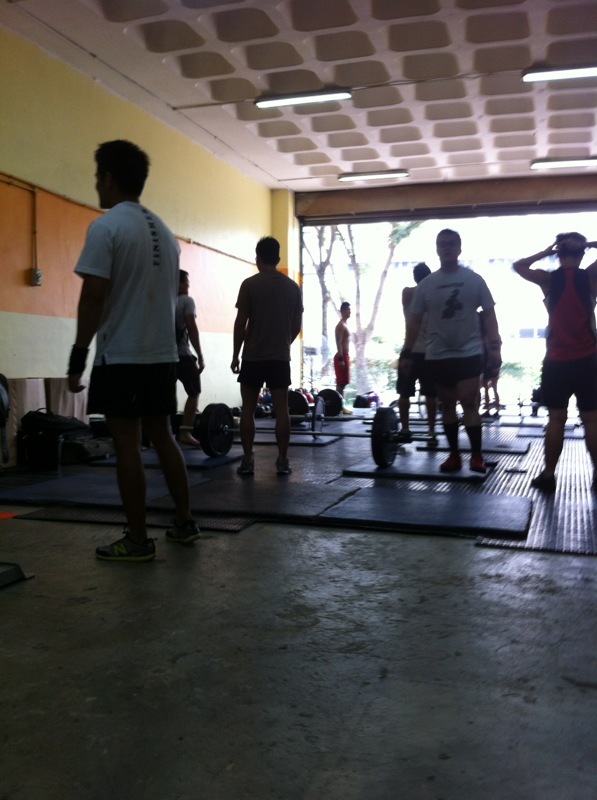 After doing some research on the available gyms in Singapore, I came across one called CrossFit Hub* that offers fundamental classes for first-timers every Saturday and Sunday from 11am – 12pm. At $25 per session, to learn more about the “art” of the “sport”, and expose myself to a “REAL WOD,” I figured it’d be a good investment and texted in to reserve my slot. I had seen plenty of CrossFit videos beforehand, and familiarized myself with some of the moves – watching Christmas Abbott do a 50lb weighted pull-up and the like. Suffice to say, I was preparing myself for the best (and worst) workout my body could possibly endure. I made it a point to come home early Friday night, sleep a full 8 hours, and eat a decent breakfast (which involved cottage cheese, flax seed, lemon in water, and scrambled eggs) but nothing within the 90 minutes before clocking in at the gym. Anyway, moving on now. Upon arriving at CrossFit Hub, I found myself standing in a converted warehouse gym surrounded by bulky men doing snatches. I was one of 3 “newbies” (all girls, incidentally), come to give it a try. Newbie #2, whom we shall call Ramona, and I were made to pair off; while Newbie #3, whom we shall call Jane, was assigned to her friend who had brought her over – a more seasoned CrossFitter, the only other girl currently working on her WOD in the vicinity. Just do what it takes. All in all, I think it was a fantastic workout and well worth the trip over. I’m not entirely sure if I’m going to actually pay the gym fees to join up with this particular/any other CrossFit gym……as I am still subscribed to another gym where I have complete autonomy over my workout, I’m a little torn. I did love the way the WOD went though, and afterward I felt that, with consistent training, I could totally become my strongest, fittest self. It has been 2 days now and I am still incredibly sore. The Wall Walks really do you in. Full body. Shoulders, arms, obliques, and back especially. Fantastic work-out and I look forward to using similar principles in my workouts to follow. Definitely one to stick with. The high intensity keeps your heart pumping the whole time so it feels like a cardio workout without being an actual, long drawn out stale treadmill experience. I would definitely recommend it to anybody who has what it takes. And to those who think they don’t, try it anyway*. 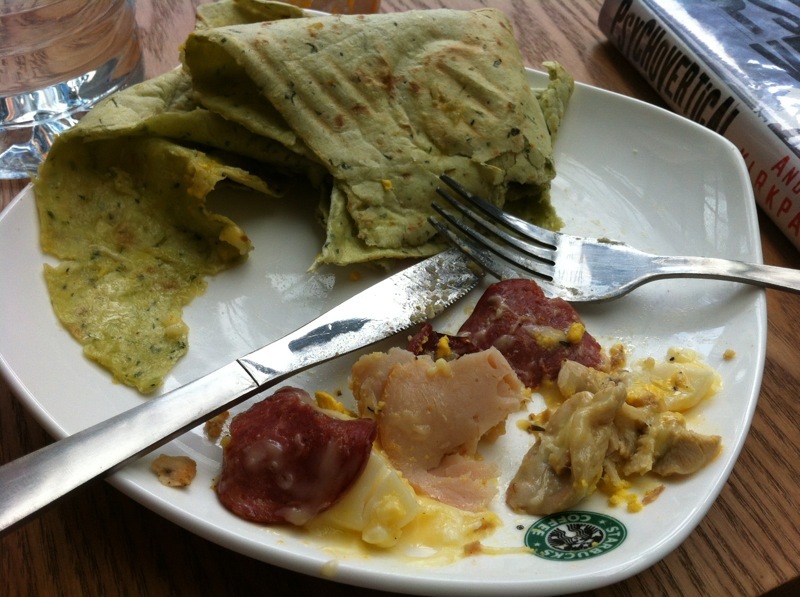 Almost entirely eaten: Meat Lovers’ Spinach Wrap from Starbucks. But as you can see, I didn’t eat the wrap. Haha. *For curious cats, this thing is delicious and has: a slice of Swiss cheese, pepperoni, turkey ham, shredded chicken breast, pickles, a slice of roast beef, a hard-boiled egg, and just the right amount of salt and pepper, to make it goddamn delicious. 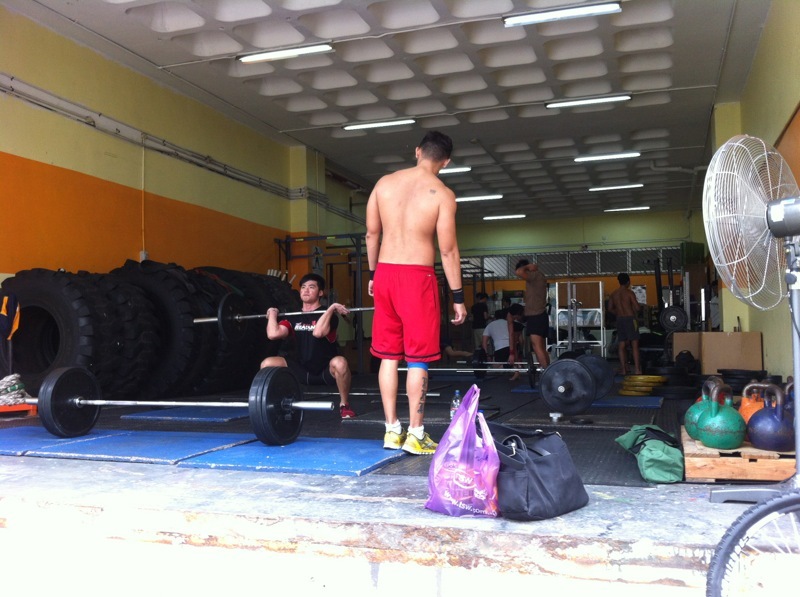 *CrossFit Hub is located in the Tai Seng area, right on the street I got into a pedestrian car accident last year. Part of me was mildly traumatized being back there after so long…not gonna lie. But that’s a whole ‘nother story………. *Ramona did not make it through the warm-up and bowed out 20 burpees in or so. She said jumping gives her motion sickness. Coach Yun was not amused. Or maybe she was and that’s what that was………..On the other hand, Jane is my new Fitness Friend (/Acquaintance) and will be checking out one more CrossFit gym with me in a couple of weeks! *Wall Walks – also known as The Death of Me – are movements that start in plank position with your feet against a wall. You then use your arms and feet simultaneously to crawl backwards against the wall until you are in handstand position, facing the wall, with your chest pressed against it. It should be noted that I only completed this properly the first set and a half. Thereafter I was resigned to imperfect wall walks. 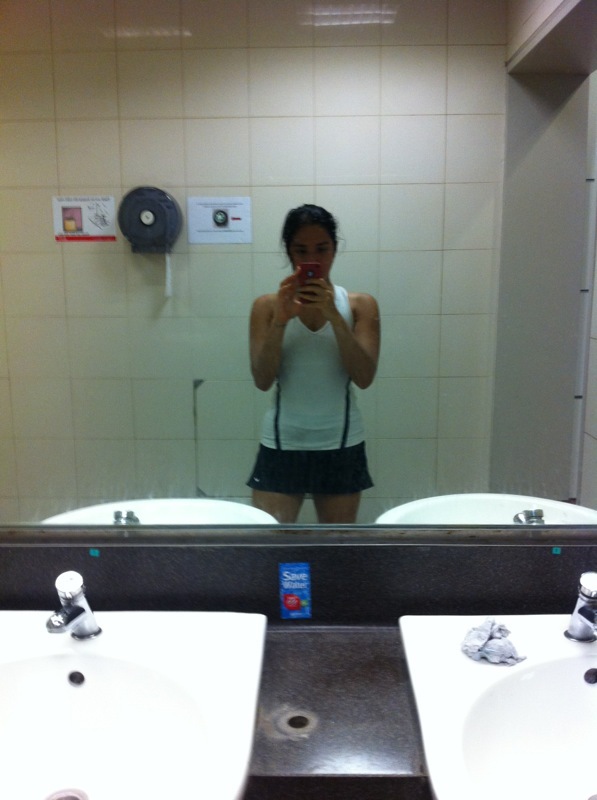 I did MUCH BETTER on the Dead Lifts (completing every set flawlessly carrying about 30kg). However, strength enough to carry one’s own body weight is central to CrossFit philosophy, so the coach was still less than impressed with my valiant efforts. *These squats were done with a round pillow like medicine ball very low to the ground placed directly beneath us and we were meant to squat til our butts touched it, and then come back up, and do that over and over within 20seconds, trying over each round to improve. My sets went as follows: 16, 17, 18, 16, 15. *UNLESS you’re just going to complain. Then by all means, please, remain unfit and unhappy. ….Just kidding. Really, don’t force yourself if you’re going to whine about it the whole time. DO WORKOUTS THAT YOU BELIEVE WORK FOR YOU AND SUIT YOUR PERSONALITY AND YOUR PERSONAL GOALS. I’m not here to judge anybody or give anybody a hard time. Do what you love to do and try what you yearn to try. 🙂 That’s what I’m doing, and it’s wonderful. 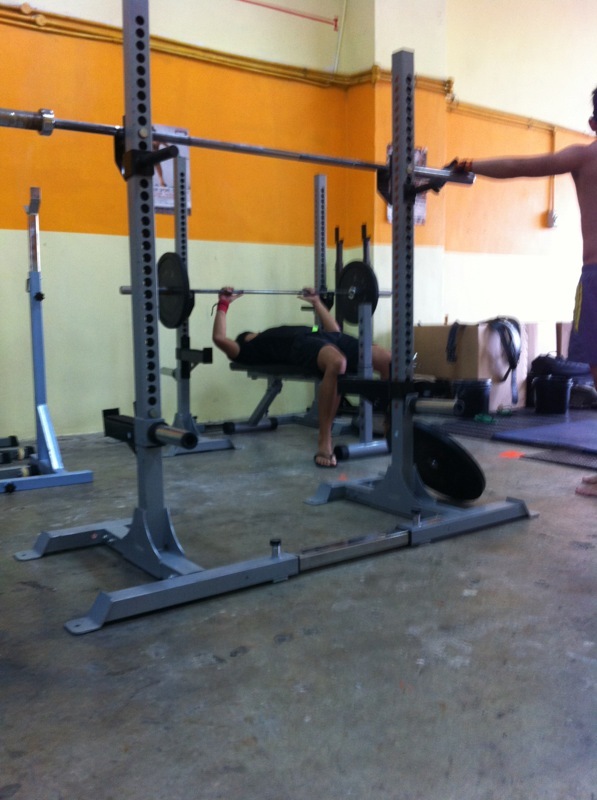 This entry was posted in fitness and tagged bucket list, challenge, crossfit, crossfithub singapore, deadlifts, fitness, gym, health, personal, review, self, singapore, squats, weights, wellness, WOD, work out. Bookmark the permalink. Glad your first WOD was good! Those wall walks sound pretty rough. I’ve been doing bodyweight and travel WODs until I get up the gumption (and cash) to join a box. So far it’s been great. Keep it up! Nice! What sort of travel WODs have you been doing? I am going for a trial next Sunday! 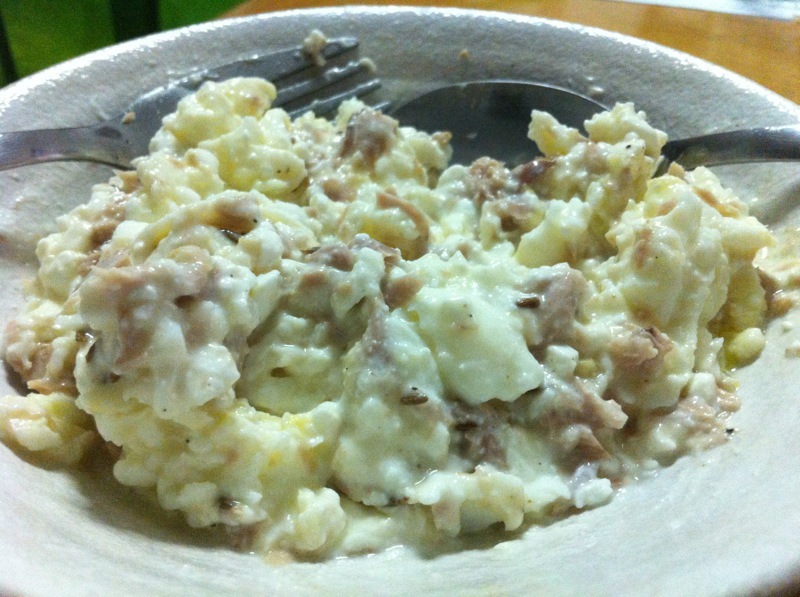 I hope it will turn out well. 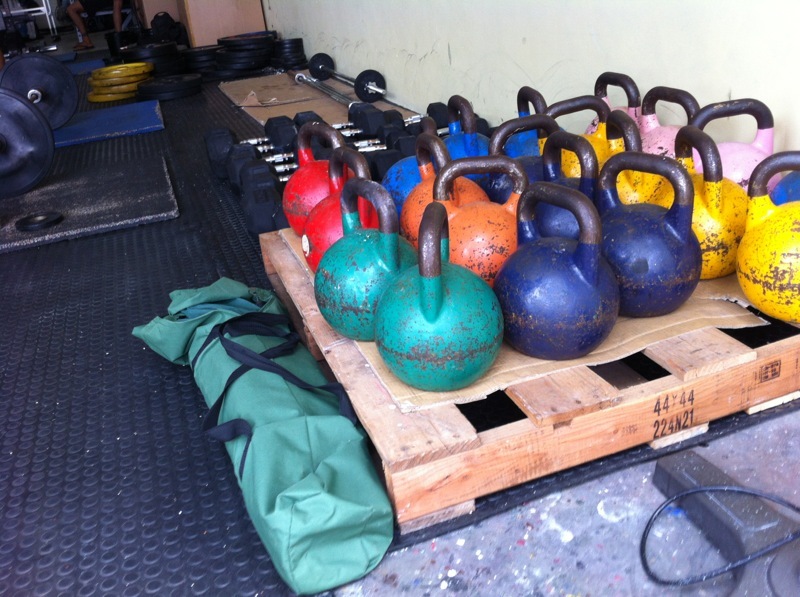 Have you tried the other crossfit boxes in Singapore, such as the Reebok one? Seems like it’s just branding? Not sure what the difference is!